The evil geniuses* at Wicked Lasers have weaponized a laser for the consumer market by simply(?) rejiggering an unreasonably-powerful blue laser diode from a home theater projector and placing it in a lightsaber casing. 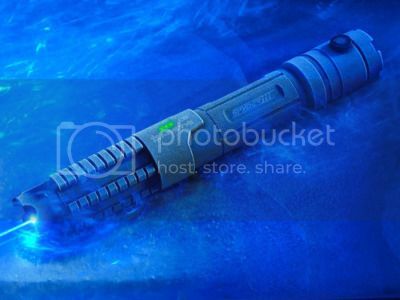 The Artic emits a 445nm cool blue, ultra high power 1W beam which appears up to 4000% brighter than the Sonar’s 405nm violet beam. Less than one year ago, this laser would have cost thousands of dollars to build. …it’s also the most dangerous laser ever created. But, wait! There’s more! Wicked Lasers is making this skin-igniting fun available for under $200, which puts it well-within the reach of teenagers, rednecks, and other upstanding members of our global community. Via Gizmodo, who is available for parties, corporate events, and skin-igniting fun. * Accessories to future felonies. I want to mount one somewhere on my car.